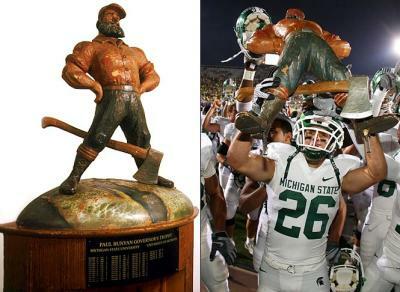 The Michigan State versus Michigan rivalry goes back a long way. Back in 1898 when the schools played football for the first time there was a seed planted. Who was the dominant program in the state? The University of Michigan, a more established program at the time, had history on their side. The Aggies from Michigan Agricultural College had a lot to prove. Later, in 1949, when the University of Michigan tried to block, now the MSU Spartans, from joining the Big Ten Conference, additional fuel was added to this in-state competitive fire and the Spartans grabbed a hold of the rivalry, winning the match-up ten times between 1950 and 1962. Since 1910 the teams have played every year, creating a 69-36-5 all-time record, in favor of the team from Ann Arbor. Since color TV was invented, however, the rivalry has evened out significantly with Michigan leading by a slight edge of 36-30 with just two ties. More recent history really favors the team in green, as the Spartans have beat Michigan 8 times out of the last ten times they&apos;ve played. It&apos;s a rivalry for the ages and as a Spartan alum it’s my favorite time of year when these two schools lock horns on the field of battle. This year the annual football battle is in East Lansing and there is an extra bit of excitement for the rivalry weekend because there is a new match-up set for that weekend. A whole new way to wear your throat out yelling GO GREEN. 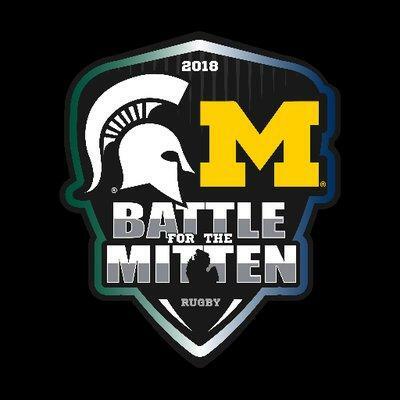 The Greater Lansing Sports Authority (GLSA), and the Michigan State University rugby team are pleased to announce that Friday, October 19th at 7 p.m. the MSU rugby team will take on the University of Michigan rugby team at Cooley Law School Stadium in the Battle for the Mitten. This inaugural event will serve as an exciting kickoff to the big in-state football rivalry weekend and organizers hope it will showcase downtown Lansing to visitors and have all the tension and energy of a classic Spartan versus Wolverine match-up. This is the first-ever rugby event for Cooley Law School Stadium. The event will also offer a free youth rugby clinic put on by Conquest Health & Fitness Foundation, the GLSA and the Capital Area Crisis Rugby Team. The clinic is open to boys and girls 8-12, no experience necessary. The first 25 to register for the youth clinic get free admission (plus one adult) to the Battle for the Mitten event. Youth clinic begins at 5:30 p.m. followed by mini flag game at half time on the field. Gates open at 5 p.m., the game will begin at 7 p.m. with tickets starting at just $10. For additional ticket or event information contact event organizer Josh Ressio at ressiojo@msu.edu. For more information about the Greater Lansing Sports Authority, visit www.lansingsports.org.